Super Bowl Power Loss: A PSA From The Cosmos : 13.7: Cosmos And Culture The power-outage at the Super Bowl in New Orleans was a reminder that the power circulating through our lives is a strange, modern miracle of science. It's a miracle we take for granted now, at our own peril. 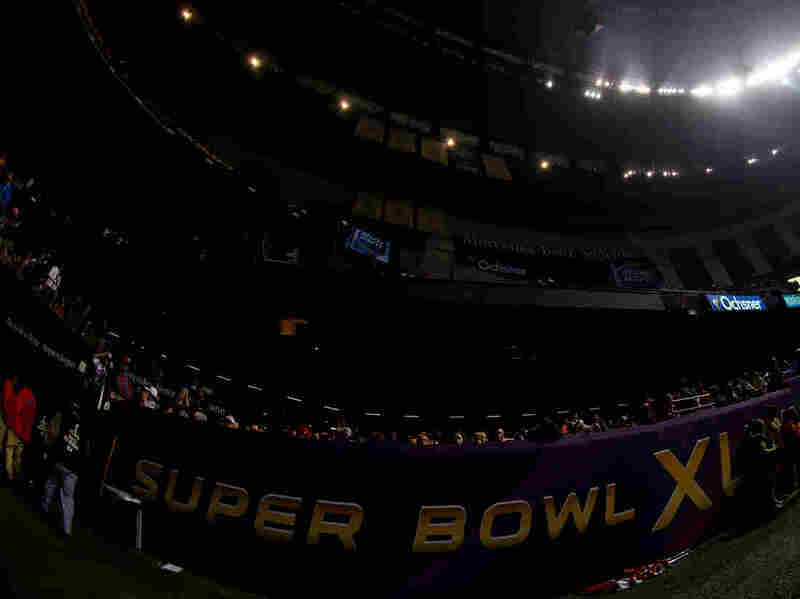 Things go dark in the Louisiana Superdome during Super Bowl XLVII. It was a Super Bowl moment like no other. Thousands of fans packing a modern gladiatorial arena, millions more watching on TV screens across the nation and Beyoncé had just reminded us of why she is, well, Beyoncé. The second half play was just getting going. And then the power failed. You don't need me to remind you of the strangeness of it. Once we all realized that Bane was not about to stride out on the field with a stolen nuclear device ("Citizens of Gotham ... ") the absurd waiting began. With one mighty mental whoosh, the entire nation asked, "You gonna to fix this or what?" But, in that strange moment, did anyone stop to ask what was really going on? What was the question really sitting before all of us as one of the greatest spectacles of modern life dissolved into goo? Power. It was all about power. Imagine asking a person in medieval Europe if they had power. They would have to think you were referring to their position in the social hierarchy. Did they have power over others? Did they have military power or land or title? What other kinds of power are there? People did have horses to plow their fields, firewood to cook their food and water-wheels to grind to their grain. But horses where kept in barns, wood was kept in the woodpile and water-wheels were housed over by the river. Until the last century, or so, no one "had" power circulating through their lives like blood flows through the body. It is a modern creation of modern science: physics; chemistry; metallurgy; engineering. Building the world we live in first demanded an understanding of energy — the ability to do work — which came in the 1700 and 1800s, along with the industrial revolution. Understanding how energy can be transformed from one form to another — the flow of current to the spinning of a motor — was just as essential. Power itself is nothing more than the flow of energy in time. That might seem a trivial definition until you recognize that everything runs down without a continuous supply of energy. In rapid succession these ideas snowballed into the modern, wired world we live in today. It's a world where every wall has (at least one) little hole where a "magic kind of something" flows out, making the lives we are so used too possible. That is what we were reminded of when the lights went out at the Super Bowl. We are all so used to these miracles of physics that we are essentially blind to them. We forget to think about what power — in the most essential sense of the word — really means. Over the last 200 years we have reached into the core of the world and learned to harness some of its most fundamental forces. With that knowledge we have built a new world of brash miracles and scalding horrors. It is immense, intense, blinding, frenetic and unstoppable. Which made the power-outage the best damn ad of the whole superbowl — a public service announcement from the universe itself — was the reminder that the power circulating through our lives is a strange miracle. It was a reminder that everything we have built with it is its own kind of miracle. And, finally, it was a reminder that, for all its power, this power-drenched reality we have created is very delicate.